Denial – had it so bad and I didn’t even know it. Because I was avoiding it. Sometimes there is nothing you can or should do. This was not the case. Remember way back in March when I said I had a blister in an unfortunate place? It went away, so I forgot about it. Then it came back. Probably in mid June when my bike mileage was really ramping up. And I shrugged. “Meh. Just part of the game. Just got to toughen up. Nothing to do about it, it’ll go away.” I thought. It’s been a while since I posted about my training. So let’s recap. At the end of May I delightedly reported I hit my new highest training week with just over 20 hours of training. I followed that with a lot of rest, logging 2:50 for the first week of June. Then 10:53, 16.04, 17:37, 8:07, 13:50, 10:58, and then an awesome 22:20 week! 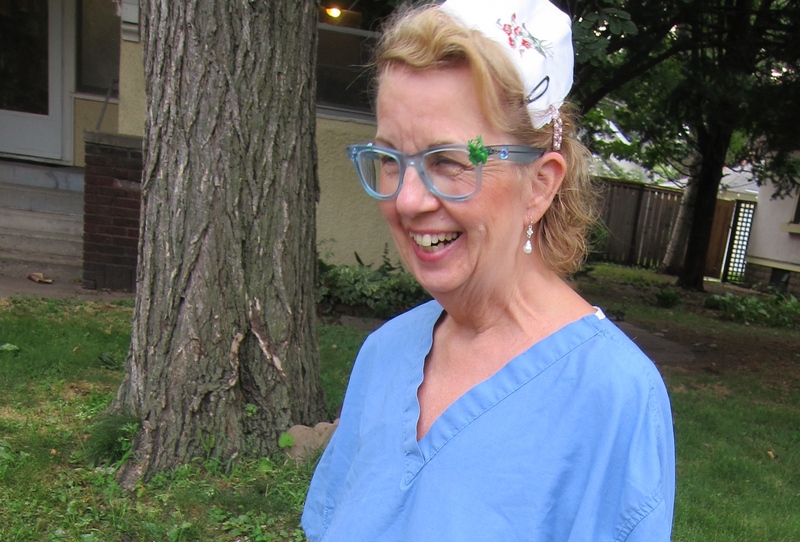 Mom dressed as NURSE-MOM SUPERHERO! Nope. It had NOT gone away. She did some online research. Then I did. Mom suggested it was a cyst – either from a blocked gland or infected hair follicle. From there I realized it could be either of those – because both can be caused by skin damage… damage like friction. It was a very bad saddle sore! There are actually a ton of bikers blogging about this. That over all these months I hadn’t thought to google this just goes to show how much I was avoiding it and denying that anything was wrong. Nurse-mom got me all set up. She helped me deep clean the bath tub. Then ran errands for the needed supplies. For the last week I’ve been doing two things religiously. 1) Epsom salt soaks. I’ve soaked for 10-15min in a shallow hot bath with 1-2 cups of dissolved salt. Ideally 3-4 times per day – but realistically twice a day. I’ve been sitting in the tub having my coffee and granola in the morning. 2) Witch Hazel swabbing. I’ve pre-dampened cotton balls in Wich Hazel and put them in a little zip bag. Then throughout the day I’ve kept the bag in my pocket to clean the sore during bathroom breaks. At first it just seemed to shed layers of skin like a bad sunburn. After 5 days it was only more tender and blister like. Finally on day 6 it finally did something. From one itty bitty hole grossness emerged. Definitely not a blister. Let’s leave it at that shall we? There is a ton of info out there regarding preventing saddle sores – go ahead and google it. – Wear clean high quality bike shorts. – Have a properly fitting bike and a saddle that suits you. – Use chamois cream. ButtShield is my favorite, I use SportShield for my wetsuit and other chafing. – Shower immediately after a ride. yada yada yada… I did all that. So once this subsides I’ll be soaking semi-regularly and always keeping clean with the witch hazel. Thanks mom for not only taking care of me but having the best sense of humor to make any sad icky situation funny. This entry was posted in Fitness and tagged biking, saddle sore, training, triathlon. Bookmark the permalink. Love this! Good info, advice, and great pictures of Nurse Mom Nancy. Thanks! I tried to be somewhat informative, but there is actually way more info out there. I’m glad you like the pictures. I thought she’d enjoy dressing for the part :-p there’s a ton of really great pictures that just didn’t make it into the blog. Hi there! I have had a professional bike fit. I had one done by Kevin at Gear West Bike and Tri. I think it all started with big jumps in time in the saddle. Plus not knowing about it, so when it was raw I was slathering it in ointment – not good for skin breathing. There’s also a hair management issue… I’ve heard some women get waxed… but I don’t think I want to go there.